Randy Parsons (front) speaks with other Olympic pin traders at the monthly pin show in Atlanta. The event has been happening at the Varsity drive-in since the 1996 Olympics. 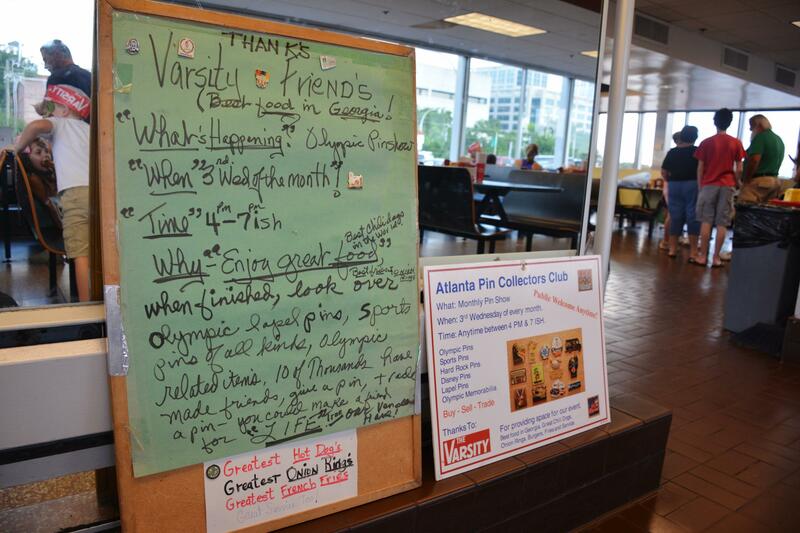 During the 1996 Olympics, Atlanta's Varsity drive-in was ground zero for Olympic pin trading. The restaurant's parking lot was open around the clock so traders from all over the world could bargain and barter. But the trading didn’t stop when the Olympic flame was extinguished. 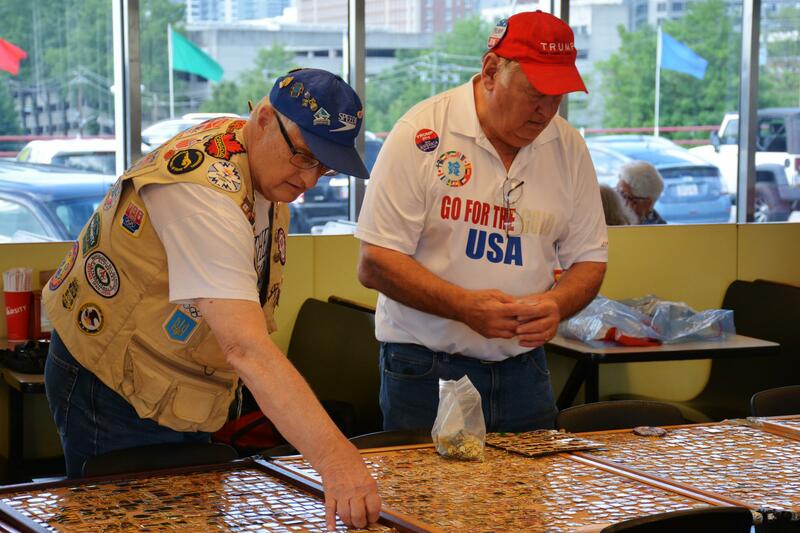 A dedicated group, the Atlanta Pin Collectors, has kept the tradition going: meeting at the Varsity once a month to buy, sell, and trade. "I thought this was going to die down in the mid-2000s,” said Scott Reed at the group’s meeting in June. Along with being a member of the Atlanta Pin Collectors, he’s vice-president of Olympin, an international Olympic memorabilia collectors club. Signs advertising the pin meetup in the Varsity's dining room. A few patrons stopped in to check out the event, but, for the most part, attendees were seasoned regulars. Reed said, nowadays, the event is more social than anything. “People here are not finding new pins. Sometimes people do, but that's not what people expect to do. People know each other. It's a place where they can come relax around people and get away from the pressures of the day,” he said. Randy Parsons, another longtime collector, said he’s always been drawn to the social aspect of pin trading. I asked Parsons to appraise a few pins I was able to find: they came from Lindsay Thomas, Senior Producer of GPB’s "On Second Thought," and studded a faded yellow bucket cap. Parsons locked on a small gold pin that read “Swaziland.” He said it likely came from an athlete competing with the country’s 1996 Olympic team and that it could fetch as much as $10 today. The pins on Lindsay Thomas's hat. Some were (moderately) valuable. "Is there a price guide? No. Do they go up in value? Very rarely,” he said. “They normally go down in value, so don't think you're gonna' go buy all these pins and make a lot of money. I give away a lot of pins, because I have so many." Parsons offered me one of his pins (he said he’s got about 70,000 of them in all), but before we could walk back to his booth, he got caught up. He just had to ask another collector whether they’d ever seen a Swaziland pin. It’s the allure of finding something new that first drew Ed Edwards to pin trading. 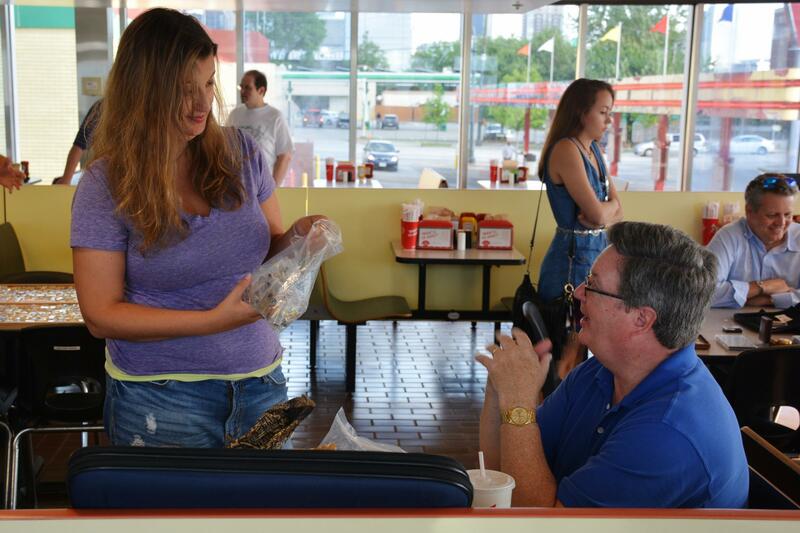 He’s another Atlanta collector who’s been coming to the Varsity to buy, sell, and trade for 20 years. Ed Edwards on how he got into pin trading. “I've had more fun with these pins and met more friends, and it's been a ride that I never would have dreamed,” he said. Edwards said his wife took him to his first pin show. He tagged along...reluctantly. Ed Edwards (right) looking over his pin spread with another collector. “The first time my wife said: We’re going to a pin show.’ I said: ‘Pin show? I don’t collect any pins.’ She said: ‘Well I’m going, and I’m not fixing supper.’ So, I ended up going to the show,” Edwards recalled. He ended up falling for pins and falling hard. Edwards has been a collector ever since. 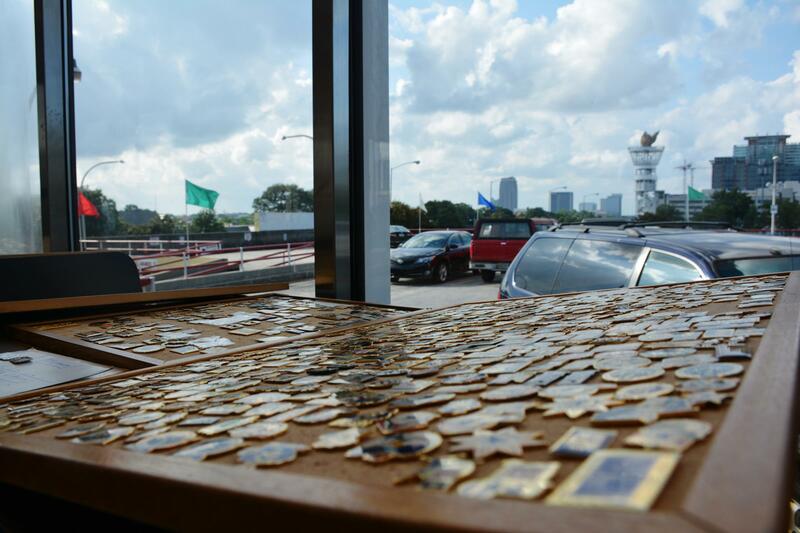 It’s easy to look around the dining room at the Varsity and see nothing but tables covered in little metal trinkets. But speak to someone like Elena Perrotta and you get a sense for the kind of emotional weight the pins can carry. She came to sell some of her mother’s pins. “Since she passed away it’s been hard for me to look at them,” she said. Her table was covered with sets of pins from the 1996 Olympics. Perrotta hoped the 20th anniversary of the Atlanta games and the coming games in Rio might make people more interested in buying from her collection. Elena Perrotta (left) discussing pins with Scott Reed (right) of the Atlanta Pin Collectors. Still, there are pins she’s unwilling to part with, like her mother’s equestrian pins and Italian team pins. “It meant so much to her that it's kind of taking away a piece of...I don't know. It's hard. She spent so much time collecting them and organizing them and trading them. It meant a lot to her. Just like it means a lot to everybody here,” she said. The Atlanta Pin Collectors expect a busy summer. Their next event will be July 20, just after Atlanta’s official 20th anniversary celebration of the 1996 Olympics. The traders think the occasion will get people digging in closets, through attics, and under beds to see what kind of treasure might be hiding there. The Olympic Torch Tower still rises over Midtown Atlanta where, 20 years on, pin trading continues.